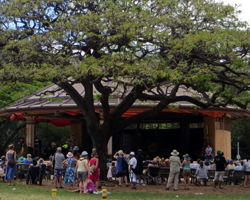 Free Royal Hawaiian Band Concerts Every Friday and Many Sundays. Royal Hawaiian Band Free Concert Every Friday! If you want to add value to your Hawaii vacation itinerary, the Royal Hawaiian Band performs an hour-long concert at the end of every work week – assuming there’s no rain. 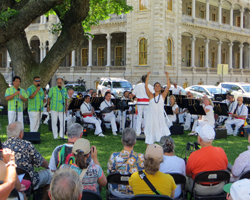 Not only is this free Honolulu entertainment easy on your pocketbook, but it’s also a great opportunity to experience some of our unique Hawaii history and culture through music, dance, and location (at the only royal palace in the United States)! I end up seeing the Royal Hawaiian Band perform three or four times every year at various Hawaii festivals, events, parades, and/or the free weekly concerts; and I always enjoy the performances. Not knowing your musical tastes, though, I feel obligated to advise you that they don’t play covers of the latest pop music. You probably won’t hear anything newer than Hawaiian statehood, which ratified in 1959. 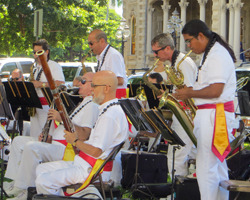 The band plays traditional marches, music of the Hawaiian monarchy, and some of the classics from the early days of Hawaii tourism. Nevertheless, this isn’t just a show for our most senior visitors. Anybody who enjoys music and the scenic Hawaii outdoors can have a good time at one of these concerts. 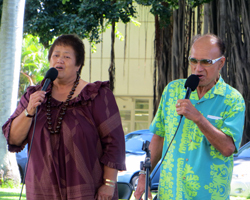 Plus there’s hula dancing, singing, and even some fun and interesting stories from Hawaii history as shared by the singers. If you plan your day right, you’ll have plenty of time – both before and after the concert – to check out some of the numerous Honolulu attractions in this immediate vicinity. You could take a tour of Iolani Palace and see the royal jewels; or walk next door behind the palace and check out the Hawaii State Capitol. Walk across Richards Street (left side of the palace) and check out the free Hawaii State Art Museum. Or cross King Street in front of the palace (use the crosswalk and be careful) to see the King Kamehameha statue at Aliiolani Hale; or go diagonal across the intersection of King and Punchbowl streets to see historic Kawaiahao Church. Broaden your sphere of sightseeing just a couple more blocks, and there are a lot of nearby things to do in Honolulu. 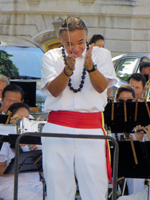 In addition to the free concert every Friday at Iolani Palace, the Royal Hawaiian Band often performs a free concert on Sundays at Kapiolani Park in Waikik. For a period, the performances frequently used to run from 1pm to 2pm. However, there have also been periods when the concerts started at 2pm and ended at 3pm. 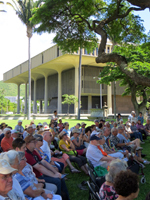 There are also numerous Sunday’s when the band doesn’t perform at Kapiolani Park – presumably due to scheduling conflicts. Thus, if you want to experience the Sunday performance at Kapiolani Park, I’d first check the official Royal Hawaiian Band calendar (link opens a new tab/window) to make sure you’re not there on a weekend when the band is performing elsewhere. 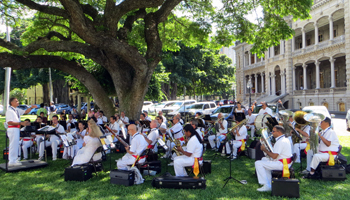 Now considered an agency of the City and County of Honolulu, the Royal Hawaiian Band was originally founded in the early 1800’s by King Kamehameha III. Thus, as the name implies, it’s the only band in the United States with a royal heritage. First as part of the kings’ entourage, and now as ambassadors of aloha, the band has traveled all over the world. But it’s the band’s familiar presence at countless local community events that makes it a special part of Hawaii culture. Whether this has any impact on the quality of each performance, I can’t say; but I think it’s interesting to point out that this band is also unique in that it’s the only full-time municipal band in the nation. Anyway, if you’re looking for low-budget Honolulu tourism activities as you plan your Hawaii vacation fun, you may want to consider some free entertainment by the Royal Hawaiian Band.